Another community poetry event is scheduled for Thursday, December 21, 7-8:15pm, in Hunneman Hall at Brookline Village Library. Check back soon for details. On Wednesday, April 25, Zvi A Sesling, hosted "Poetry in Translation" in Hunneman Hall, Brookline Village Library. This was an evening of international poetry as more than 15 poets read poems in the original language, followed by the English translation. ​The Bagel Bards, a literary group founded by Doug Holder and Harris Gardner in 2004, meet every Saturday at Au Bon Pain in Somerville, but for one night only on Thursday, October 26 from 7 to 8:15pm they entertained Brookline in Hunneman Hall at Brookline Village Library. Featuring Bagel Bards Dennis Daly, Gloria Mindock, Doug Holder, Deborah Leipziger, Lawrence Kessenich, Timothy Gager and Brookline's own Poet Laureate, Zvi A Sesling. ​Zvi A Sesling, Brookline's third poet laureate, and past poets laureate, Judith Steinbergh and Jan Schreiber, invited the community to a well attended special poetry event, The Changing of the Bard, at Brookline Village Library, Hunneman Hall, on Thursday, May 11, where they read from the works of New England poets. ​An evening of poems & music on Wednesday, November 2 at 7pm in Hunneman Hall at Brookline Public Library. ​The ancient art form of poetry spoken to music is given new life by poet Rhina Espaillat and guitarist/composer John Tavano. This free evening is hosted by Brookline Poet Laureate Jan Schreiber. ​Jan Schreiber, Brookline's second poet laureate, was inaugurated on April 1, 2015. With some guidance and much choice, try your hand at writing a poem about something from the natural world that intrigues and moves you, something you'd wish to protect or preserve. Novice and experienced writers are welcome. Space is limited so please contact Judith at brooklinepoetlaureate@gmail.com with your name and contact info if you plan to attend. Contact Judith at brooklinepoetlaureate@gmail.com if you would like to read one short to medium length poem on a facet of our natural world that intrigues or concerns you. Please leave your full name, email or phone and the subject of your poem. Poems must be appropriate for family audiences. The Poetry Brookline program that was developed by Judith Steinbergh, Brookline's Poet Laureate, produced a wealth of work created by the Brookline community from the ages of 8 to 80 and beyond. Judith, in collaboration with Feng Yang in the IT Dept of town hall, created a wonderful interactive map of Brookline to show the locations that some of the poems were written about.. To visit the Brookline Poetry Map please click here then click on the icons along the bottom to visit various sites. You can then enlarge each poem by clicking on the poem itself. Please contact Judith at brooklinepoetlaureate@gmail.com if you would like to spend an afternoon combining poetic lines (yours or borrowed) with art in a simple handmade book. Space is limited. Please leave your full name and contact information. Meets 12-1:30pm in the conference room in the Main Library. Bring your own lunch and copies of poems will be provided. No sign-up or preparation is necessary. Each month the group will read and discuss half a dozen poems of a well known poet. All Welcome. Fall dates: Sept 4 (Naomi Shihab Nye); Oct 2 (John Ashbery); Nov 6 (Adrienne Rich); Dec 4 (Ella Wheeler Wilcox). The group meets once a month on Sunday afternoons, Sept through May, normally in Hunneman Hall at the Main Library, with one or two established poets reading, followed by an open mike. The organizers can be contacted at poetry@brooklinelibrary.org. Please do not send written correspondence in care of the library. Judith Steinbergh, Brookline poet laureate, introduced 30 readers ranging in age from 9 to 80, to read poems or sing songs about Brookline places, people, memories, and relationships to a packed out Hunneman Hall. Click here to sample the songs, poems and odes to our town, its parks, woods, neighborhoods, food delights, seasons, cycles, changes, history, and so much more. Brookline" event on Oct 15. This free event was a lyrical, insightful evening of poems by 10 readers in 10 languages. Poems were read in Japanese, Chinese, Bengali, Spanish, French, Creole, Italian, Farsi, German, and Russian. These poems, with their own rhythms and structures, images and references reflected Brookline's international community. 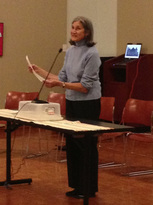 Judith Steinbergh thanked all who read and shed light on the poems, poets and cultures. The event will soon be available on BATV. See here for photos and some of the poems that were read.